While answering questions raised by journalists and the BJP that were based on OpIndia story about Kapil Sibal and his wife acquiring a company named Grande Castello, senior Congress leader and lawyer Kapil Sibal threatened to sue OpIndia for defamation. This, when OpIndia story has only asked a few questions to Sibal about the acquisition and valuation of the company. And this, when the Congress party claims to support journalists’ right to ask questions to powerful people. In our story, we had questioned whether Kapil Sibal and his wife Promila Sibal bought a company named Grande Castello limited pretty cheap – possibly at the value of the paid-up capital of the company i.e. 1 lakh rupees – because the company had huge liabilities and the major asset it had – a piece of land in New Delhi municipal area – was devalued prior to Sibals acquiring the company. It should be noted that companies being bought just at the paid-up capital value or less is not indicative of any scam. A loss-making airline Spicejet was sold at just 2 rupees by Maran brothers in 2015 to businessman Ajay Singh because it had huge debts and liabilities. Grande Castello similarly had major liabilities and loans and thus the company being bought at paid-up capital or even less can be legally justified. We tried to reach out to Kapil Sibal to get clarification about it, but we did not get any response, and we published the story with the facts available in public domain as well as the questions we had sent to Mr Sibal. It is indeed intriguing what is so defamatory in the whole process that Mr Sibal wants to sue OpIndia. We still don’t know what price the company was acquired at by Mr Sibal. He maintained that it was legal acquisition but did not specify the amount paid during his interactions with journalists earlier today. Now, there are two theories. One is that the company was bought at nominal 1 lakh rupees, which was the paid-up capital of the company which had a negative net value at the time of acquisition. If this is true, then it would mean that Mr Sibal managed to get prime land, which was devalued by changing accounting system — and thus creating a negative net value for the holding company — right before Sibal took over. The second theory came to light when at noon today I was mysteriously contacted by Mr Piyoosh Goyal. He claimed that the deal went through for Rs 50 crores. If true, it would again be intriguing as to why Kapil Sibal paid such a high amount for a company that has liabilities running in the same range with no apparent business except owning a piece of land in New Delhi areas valued less than the liabilities. 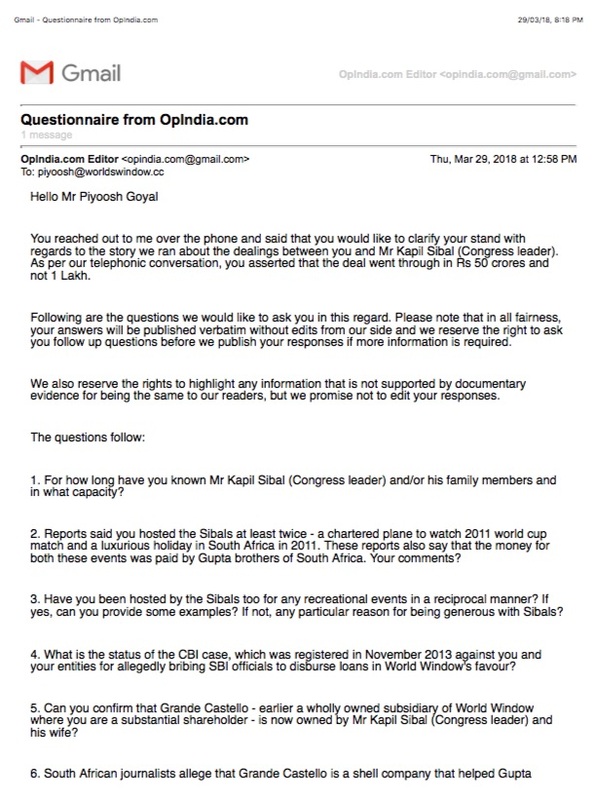 To that assertion, I, as Editor of OpIndia.com, said that I would be emailing a detailed questionnaire to Goyal, and if he can provide documentary evidence, his unedited response would be published. As can be seen, the questions were sent to Mr Piyoosh Goyal at 12:58 PM. Till the time this story broke on mainstream media, we had not got a response from Mr Goyal. At about 8:00 PM, a good 8 hours later, I again got a call from Mr Goyal saying that he had already made his statement to Republic TV and hence didn’t wish to respond to our email. And thus, we got no documentary evidence to support the Rs 50 crores claim. Now, let’s assume Piyoosh Goyal’s claims of the deal going through at Rs 50 crores was authentic. The question then arises why would Sibal pay Rs. 50 crores to buy a company whose net worth was in the negative owing to a devalued land and 51 crores liability. We have forwarded questions to confirm both theories. One to Mr Sibal and one to Mr Goyal. Sadly, we have got no response from either. In fact, we asked questions about the acquisition of the company. Mr Sibal in his presser has mixed up and referred to the company being bought once, and switched to talking about buying the land in the next moment. The reason we wanted to know about the amount paid as well as about him owning the company is because he had – rather strangely – denied that he owned the company in January this year, even though the documents suggested that he had bought the company in the financial year 2016-2017. Full details of Sibal’s exchanges with the South African journalists can be read here. 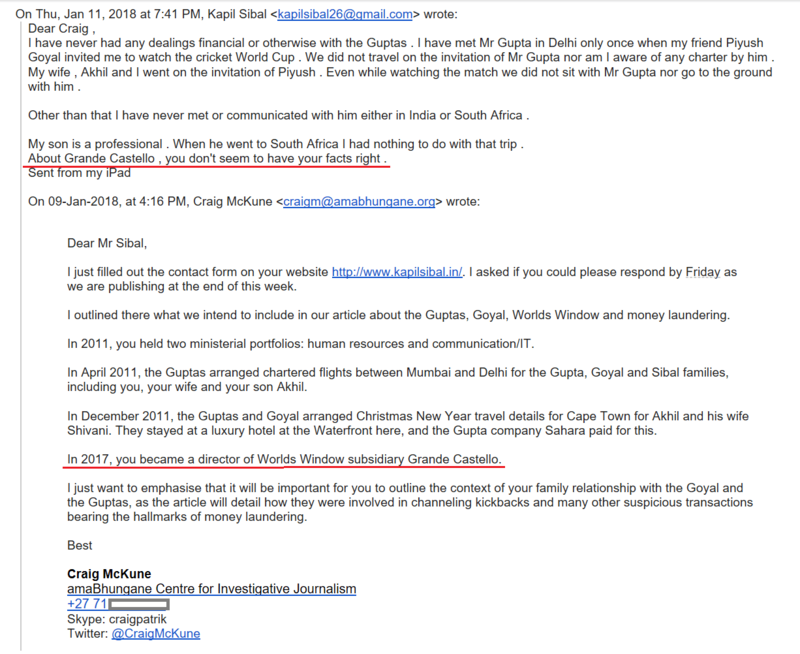 Our questions were based on this suspicious and intriguing behaviour by Kapil Sibal while responding to questions by the South African investigative journalists. We made no allegations and rather asked questions. What was extremely intriguing is the way land was de-valued a year before Kapil Sibal bought Grande Castello, making the net worth of the company virtually negative. This is why we argued that Kapil Sibal could have paid any non-zero number to acquire the company (and we grant that it would still have been a legal transaction). Our story was based on the research of a remarkable group of South African journalists and we stand by our story. 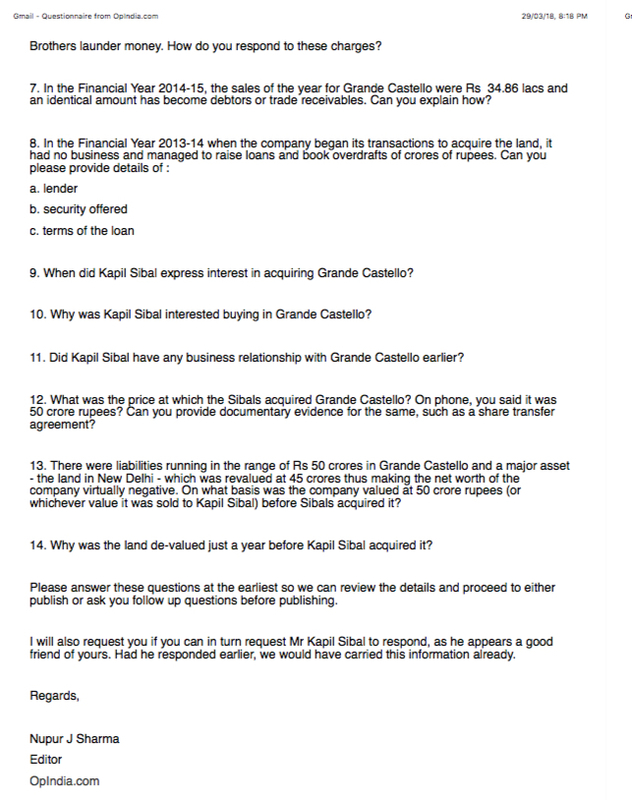 If Mr Sibal thinks we should be sued for asking him questions, there isn’t much we can say to that, can we?